This Homemade Baked Beans recipe is a must-have at all of our BBQ’s. 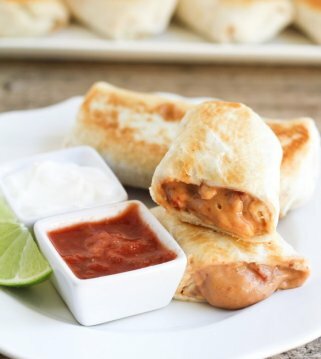 It’s such a simple and easy recipe, requires only FIVE ingredients, and cooks in the crock pot. Everyone who tries it agrees it’s the best baked beans recipe. Does your family like to BBQ? My family LOVES to BBQ, which is a good thing for me because I LOVE BBQ foods. I didn’t always love it, but it’s my hubby’s favorite, and because of that we’ve had it more often, making me like it more. Now, when the Lunas BBQ, we go all out. Hamburgers, hot dogs, steak, chips, dips, salads, fruit, baked beans and more are always served. 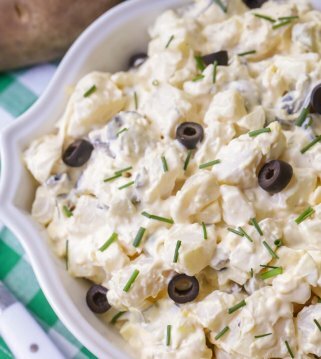 Two recipes we ALWAYS have are my mom’s Potato Salad recipe (it’s the bomb.com!) and my aunt Georgie’s Baked Beans recipe. Everyone always expects these two items to be there, and they’re always gone before you know it because they are so stinkin’ good. What kind of beans are baked beans? Here’s a fun fact for you: The name “Navy bean” is an American term coined because this type of bean has a staple for the sailors in the US Navy since the mid-1800s! 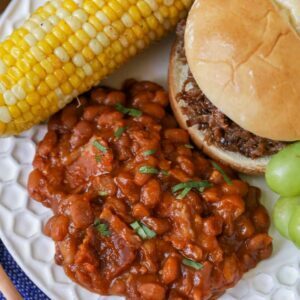 This Homemade Baked Beans recipe is a must-have at all of our BBQ's. 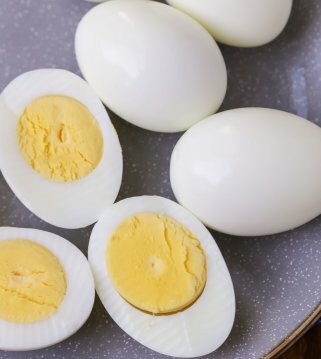 It's such a simple and easy recipe, requires only FIVE ingredients, and cooks in the crock pot. Mix all ingredients together and put into a crock pot. Cook on LOW heat for 4-5 hours. Oh how I love grilled hamburgers. My favorite meal of all times. I have salad, baked potatoes or corn on the cob,and baked beans. Sometimes I will grill chicken too for anyone that doesn’t eat beef. I love baked beans, but I am the only one in my family that does 🙁 So I only get them at restaurants or at other people’s houses. They look delicious though!! This recipe looks almost exactly like my grandmother’s. The only difference was she put hers in a big ol’ iron pot and baked them in the oven for most of a day. You have my mouth watering…I need to try yours. I never got so adventurous to make hers because of that whole being at home watching the over all day thing. The crockpot would be such an awesome alternative!!! Thanks for posting. I will have to try these! I am all about the “cookout” food. This recipe is very similar to the one handed down to me from my mother. But mine uses hot dogs instead of bacon and I also put 1 1/2 tablespoons of molasses in mine. Very yummy!! Just a friendly reminder in South Africa what is know as a hit at a BBQ is beer. Lots of beer. And more beer. These are delicious. Could these be cooked in the oven? I am using the crock pot for something else. I make my baked beans similar only use cans of any type of Buschs baked beans, add the brown sugar and some molasses and bake 250 for about an hour. The molasses really thickens them up nicely! Sounds perfect! Thank you for sharing!! tastes good and so easy…. That is why we love it so much!! Thank you for letting me know!